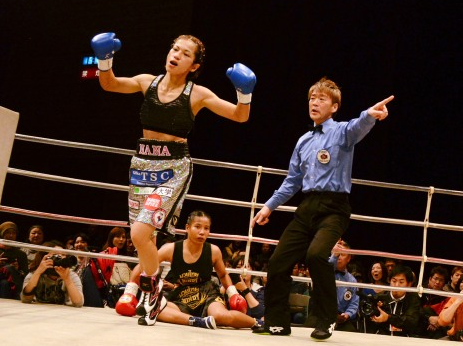 Yoshikawa Nana wins OPBF title in third fight! Former female amateur stand out Yoshikawa Nana (3-0, 1) not only recorded her first stoppage victory earlier today but also claimed her first title as she won the the OPBF female Light Flyweight title. Nana quickly took control of her bout with Thailand's Krikanok Islandmuaythai (4-4-1, 2) by starting fast and immediately found a home for her right hand before forcing a stoppage in just 101 seconds to take the victory and the title. Interestingly it had taken the great Momo Koseki 5 rounds to stop the Thai last year. Sadly for Krikanok however she hasn't been the same since the Koseki fight and has now lost 4 successive fights. With a long amateur career behind her Nana was always expected to win here though few would have expected such a quick and impressive destruction of a former world title challenger. What the victory has effectively done is put the Light Flyweight division on alert and Nana will likely be looking to make a step up to a world title fight before the year is out.